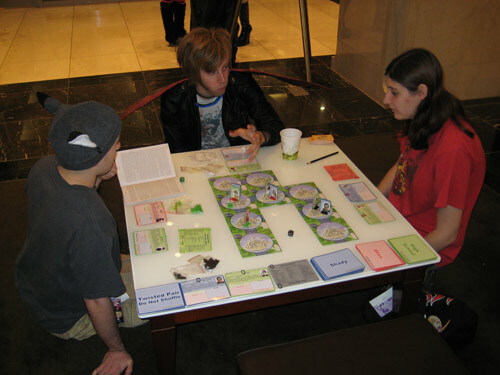 Well Collateral Damage: The Anime Board Game launched with great success at Reactor in Wheeling, IL. We ran several demos and had a lot of people buy the game, and even more stop by our table to chat or say how much they liked it. It was very positive, and I hope that we continue to have success like this at our upcoming conventions. We’ll be posting a calendar soon with our planned schedule for 2008. 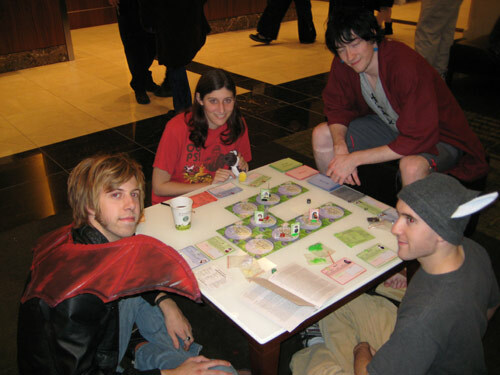 Special thanks go out to the groups of people who were playing Collateral Damage in the lobby Friday and Saturday night. A big special thanks also goes out to Nick, who liked the game so much that he helped us out at the table, bringing over other people to see it and being one of our biggest advocates. You rock! Your support is what made Collateral Damage possible. We also had a booth at Con on the Cob in Akron, OH. This was also a success, and we got several people interested in the game, one from as far as Israel! We were also interviewed for a podcast, and we’ll announce that as soon as it’s up. Thanks again to everyone who has supported us! We look forward to keeping you informed on the web site, and at more conventions in 2008.